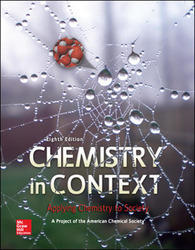 Following in the tradition of the first seven editions, the goal of this successful, issues-based textbook, Chemistry in Context, is to establish chemical principles on a need-to-know basis for non-science majors, enabling them to learn chemistry in the context of their own lives and significant issues facing science and the world. The non-traditional approach of Chemistry in Context reflects today's technological issues and the chemistry principles within them. Global warming, alternate fuels, nutrition, and genetic engineering are examples of issues that are covered in Chemistry in Context. With each new edition, the author team reworks the content of practically every chapter, updating it to reflect new scientific developments, changes in policies, energy trends, and current world events. For example, the nuclear tragedy in Fukushima, Japan is explored in Chapter 7. Chapter 3 now presents more data on the chemistry of global climate change. More examples of green chemistry have been added to this edition. This expanded coverage offers the reader an even better sense of the need for and the importance of greening our chemical processes. For easier access, key ideas in green chemistry are listed on the inside front cover of the text. LearnSmart is an adaptive diagnostic learning system, powered by Connect Chemistry and based on artificial intelligence, constantly assesses your knowledge of the course material. As you work within the system, LearnSmart develops a personal learning path adapted to what you have actively learned and retained. This innovative study tool also has features to allow the instructor to see exactly what the student has accomplished, with a built-in assessment tool for graded assignments. Web-based activities found on the Connect site are integrated throughout the text noted with icons. These web-based act ivies help students develop critical thinking and analytical problem-solving skills based on real-time information. Every chapter has a figure that "comes alive" through interactivity. This feature resides on the books Connect Site and can be assigned by the instructor. Wide variety of embedded in-chapter question types: "Your Turn" (basic review, more traditional), "Consider This" (critical thinking), and "Skeptical Chemist" (analytical reasoning), which also includes questions that directly use the internet. The questions are plentiful and varied. They range from simpler practice exercises focusing on traditional chemical principles to those requiring more thorough analysis and integration of applications. Some of the questions are the basis for small group work, class discussions, or individual projects. End of chapter questions (50-60 per chapter), categorized as "Emphasizing Essentials", "Concentrating on Concepts", and "Exploring Extensions", some of which also use the internet. The Instructor's Resource Guide is a comprehensive resource useful for those teaching Chemistry in Context for the first time, as well as for those with more experience. It is housed on the Connect site and includes answers to in-chapter and end-of-chapter questions, sample syllabi and tests. McGraw-Hill's CONNECT. With Connect Chemistry, instructors can deliver assignments, quizzes, and tests online. The problems, directly from the end-of-chapter material in the textbook, are presented in an auto-gradable format. The online homework system incorporates new and exciting and interactive tools including the market standard drawing tool - ChemDraw. Jan Smith's problem-solving methodology is carried over from the textbook into the online homework system. End-of-chapter problems and additional problems are available to assign within the Connect program. Instructors can edit existing questions and write entirely new problems; track individual student performance - by question, assignment, concept, or in relation to the class overall - with automatic grading; and secure storage of detailed grade reports online. Grade reports can be easily integrated with learning management systems such as WebCT and Blackboard. Single sign-on integration is available with Blackboard. Connect Chemistry Plus provides students with online assignments and assessments, plus 24/7 online access to an eBook – an online edition of the text – to aid them in successfully completing their work, wherever and whenever they choose. This new ebook option offers a sustainable choice for students, which correlates directly to the overarching theme of this new edition. Chemistry in Context's content is significantly updated with each edition, to reflect the most up-to-date scientific and social issues. Chapters begin with a societal-technological issue that forms the context of the chapter. Chemical principles are then embedded within the context of that issue. Because learning begins with curiosity, not mere statement of facts, this approach teaches fundamental concepts and chemical principles required to respond to the problem on a need-to-know basis throughout the chapter.